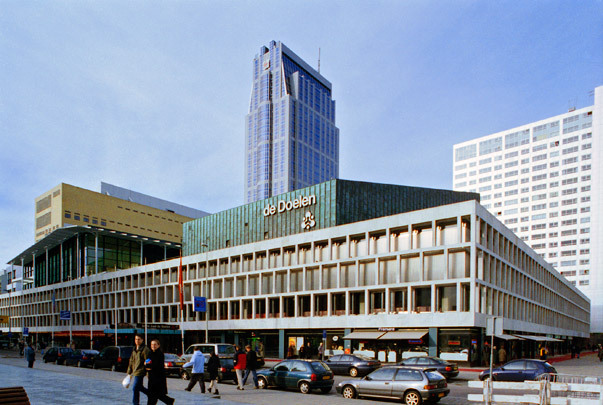 Rotterdam's concert hall has a square plan shared by a number of principal forms. Reacting against the business-like city centre, its appearance was intended as an expression of culture, hence the copper facing of the roof structure and more particularly the stone ornamental facade. This grid of beams and posts has not gone uncriticized; the structurally illogical facade suggests three storeys rather than the actual one or two. Jan Hoogstad's new additions along and above the concert hall house congress facilities and the combined Rotterdam Dance Academy and Conservatoire.